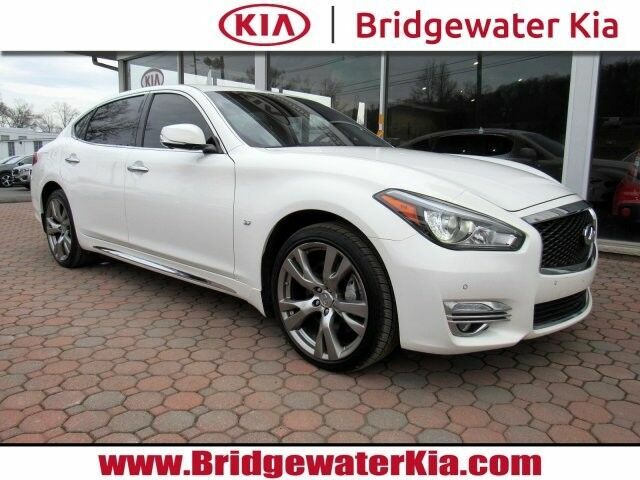 2015 Infiniti Q70L 3.7 Deluxe Touring AWD, Moonlight White Pearl Exterior over Java Leather Interior, ORIGINAL MSRP: $64,030.00, FACTORY OPTIONS INCLUDE: Deluxe Touring Package (Originally $3,900), Bose Studio Surround Sound System, Power Rear Sunshade, Suede-Like Headliner, Japanese White Ash Wood Interior Trim with Genuine Silver Powder Accents, Semi-Aniline Leather Appointed Seats, Soft Double Stitched Meter Hood, Technology Package (Originally $3,300), Intelligent Cruise Control with Full-Speed Range, Distance Control Assist, Predictive Forward Collision Warning, Front Pre-Crash Seatbelts, ECO Pedal, Blind Spot Warning and Intervention, Backup Collision Intervention, Forward Emergency Braking, Lane Departure Warning and Prevention, Adaptive Front Lighting, Premium Package (Originally N/C), Voice Recognition Touch-Screen Navigation System with 8-Inch Color Monitor, Around-View Monitor with Moving Object Detection, Front and Rear Sonar System, Climate Controlled Front Seats , Heated Steering Wheel, Performance Tire and Wheel Package (Originally $1,150), Sport Brakes with 4-Piston Front/2-Piston Rear Calipers, 20" 5-Spoke Aluminum-Alloy Wheels, Illuminated Kick Plates (Originally $465), Moonlight White Pearl Exterior Paint (Originally $400), VEHICLE HIGHLIGHTS: Enhanced Intelligent Keyless Entry with Push Button Engine Start, Remote Start System, Voice Recognition Touch-Screen Navigation System with 8" Color Monitor, Around-View Monitor with Moving Object Detection, Front and Rear Sonar System, Intelligent Cruise Control with Full-Speed Range, Lane Departure Warning and Prevention, Forward Emergency Braking, Distance Control Assist, Predictive Forward Collision Warning, Blind Spot Warning and Intervention, Backup Collision Intervention, Active Trace Control, AM/FM/Satellite Radio CD-Player and USB Connection for iPod Interface, BOSE Studio Premium Surround Sound System with 16-Speakers, Bluetooth Streaming Audio and Hands-Free Wireless Phone Connection, Multi-Function Heated Leather-Wrapped Steering Wheel with Audio Controls, Power Tilt/Telescoping Steering Column with Memory, ECO Pedal, Heated/Ventilated Power Front Leather Seats with Power Lumbar Support, Driver Seat Memory, Entry/Exit System for Driver, Heated Second-Row Leather Bench Seats, Tinted Glass Power Tilt/ Slide Sunroof with Sunshade, Power Rear Sunshade, Dual-Zone Automatic Temperature Control with Air Filtration, Rear Climate Control Air Vents, Japanese White Ash Wood Interior Trim with Genuine Silver Powder Accents, Suede-Like Headliner, Soft Double Stitched Meter Hood, Auto-Dimming Interior Rear-View Mirror, Homelink Garage Door Opener, Sequential Welcome Lighting, Front Door Handle Courtesy Light, Automatic Adaptive LED Headlamps, LED Daytime Running Lights, LED Front Fog Lights, Power-Folding Auto-Dimming Heated Exterior Mirrors with Revers Tilt Down Feature, Rain-Sensing Speed-Sensitive Variable Intermittent Windshield Wipers, 3.7L 330 HP 24-Valve 6-Cylinder Engine, 7-Speed Automatic Transmission, Manual Shift Mode with Downshift Rev Matching, Infinity Drive Mode Selector with Standard, Sport, Snow or ECO Modes, Infiniti Intelligent Full-Time All-Wheel Drive System, Infiniti Drive Mode Selector, Sport Brakes with 4-Piston Front and 2-Piston Rear Calipers, 20" Split-5-Spoke Aluminum-Alloy Wheels with All-Season Tires, GUARANTEED Financing for All Types of Credit! Extended Warranty Available. *Pricing on this web site includes all costs to be paid by consumer, except for licensing costs, registration fees, dealer documentary fee of $499, and taxes. Internet price reflects $1,000 finance discount. If customer does not finance with us the price increases $1,000 over the advertised price after advertised price are plus tax and title, DMV, dealer fees and $1295 reconditioning. Please confirm the accuracy of the included equipment by calling us prior to purchase. All pricing and details are believed to be accurate, but we do not warrant or guarantee such accuracy. The prices shown above, may vary from region to region, as will incentives, and are subject to change. Vehicle information is based off standard equipment and may vary from vehicle to vehicle. Most pre-owned Kia models are eligible for factory certification. Certification is optional. Call or email for complete vehicle specific information.